Authenticity warranty. Stamps MNH **. 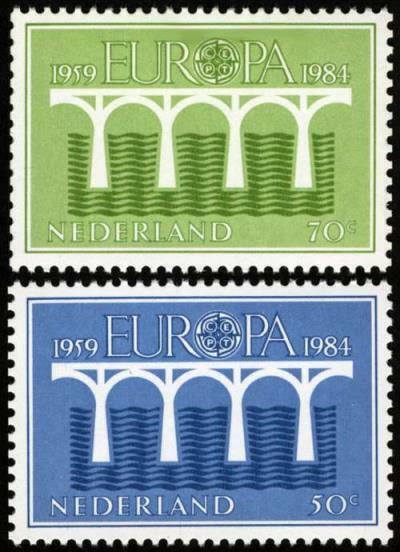 1985 have been manufactured different special stamps in roles when desired by larger Dutch dispatch companies - so also the CEPT stamps of 1984. Advertising letters could be franked so by machine. The post office of the Netherlands communicated this briefly, it stressed however that the stamps would not exhibit differences (compared with the stamps from sheets). One only indicated that each fifth stamp is back numbered and that the lateral Perforation could exhibit qualitative lack, because of the machine separation at the print. Therefore the stamps remained nearly unconsidered by the philatelic market and were used. Only after the sellout the differences of the perforation became admits with the Europe stamps. The prices shot upward. The Michel catalogue 1988 evaluated the set with 250,00 DM!